Note These installation instructions assume a Tomcat webserver. If not using a Tomcat server, use your webserver's method for deploying .war files. Optionally configure the applications data directory to store configurations outside of the kinetic-task webapp (this will make future upgrades much easier). Go to the Admin tab of the Task Console. This console page has the single purpose of starting and stopping the task engine. It will only affect the engine on the same web instance, not all instances related to a database. Use the buttons on the right side of the page to Start or Stop the task engine. When you first start Kinetic Task (using the instructions above) it will be running in unlicensed mode. In unlicensed mode there will be an orange bar on the top of the page, notifying you that Kinetic Task has not been licensed. Besides the orange bar there is also a technical limitation to unlicensed mode. The Task Engine will only process so much work at a time. After the set amount of work has been processed (25 runs) the engine will stop and need to be restarted manually via the consoles. When the engine has stopped for this reason, there will be another message displayed beneath the orange Unlicensed bar. To restart the engine you can click the Engine link in the message, or you can select the Admin tab on the top and then the Engine tab on the left. This will take you to the Task Engine page. 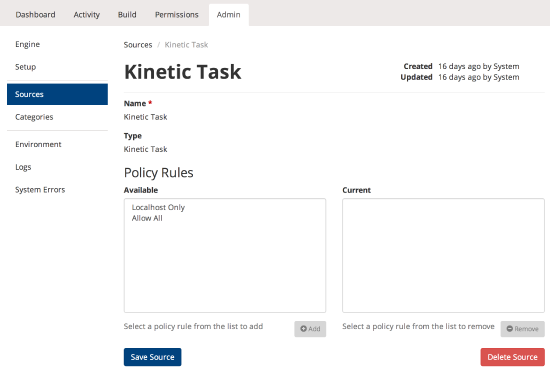 This console page includes four dialogs that relate to initial install of Kinetic Task and any changes that could be made. This dialog contains properties about the Task engine that are saved to the database. These are originally set during the install. Sleep Delay. Number of seconds that engine waits before checking for new triggers. Max Threads. Number of current workers. Setting to 0 defaults to one meaning triggers are processed one at a time. More than one thread will process that many triggers simultaneously. Trigger Query. Default is 'Selection Criterion'=null. Change this value to have this engine only process triggers with the set value. Trigger creation must include the specified value. Configurator Username & Password. Update the default username|password used to originally access the consoles during install. Default values are admin|admin. INFO. Least amount. Common Production setting. TRACE. As much information as possible. Common Troubleshooting setting. Log Size. Set in MB. Logs are available from the Logs link on the left side of the page. This dialog holds the license key and information about the key including company and expiration. Export License button exports the key and associated information as a text file. Potentially used for troubleshooting or database updates. Import License requires a specific format and has internal error checking. The License will be supplied in the required format by Support when your license is provided. This dialog determines what system is used to authenticate to the Task Engine and Consoles. The application comes with a basic authenticator using the User information from the Permissions console. Changing the Authenticator drop-down to Proxy and providing different information in the Authenticator JSP could allow the use of SSO. This dialog allows you to update/change the database in use by the application. 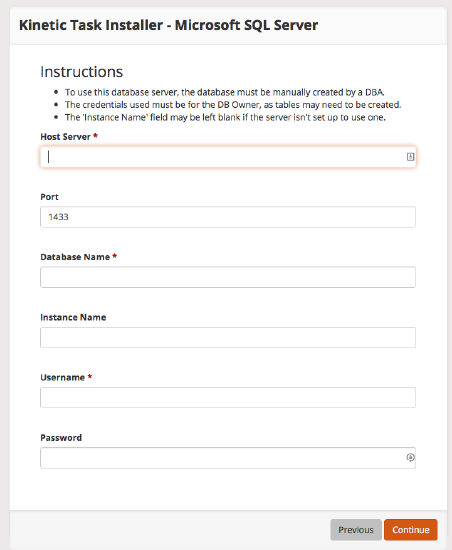 Clicking the Change Database button will run a portion of the install process to connect the web instance to a new database. You are responsible to make sure that the database is running, compatible, and ready for the install process. Warnings are posted on this panel. 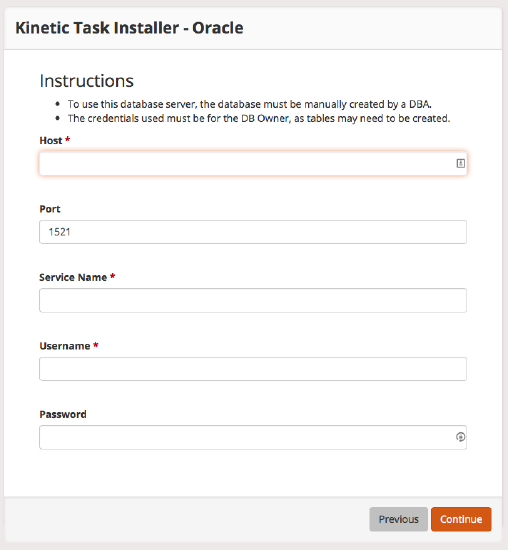 ** IMPORTANT NOTE ** Kinetic Task comes with an embedded H2 database to make it easy to get started. This database is not meant for Production Use. 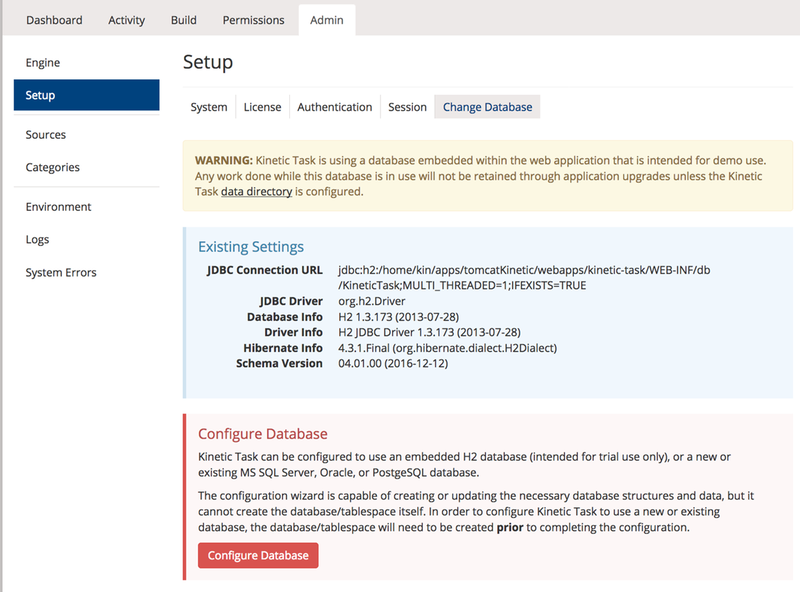 Until you configure Kinetic Task for a there will be a warning message displayed at the top of each page, and a more detailed error on the Change Database console. Clicking on the Change Database button starts the process of configuring Task to point to another database. Three other database options are available, Oracle, Microsoft SQL Server and PostgreSQL. Before you can use another database, you need to have two things done by your DBA. Database needs to be created. In Oracle this is called a Tablespace. In SQL Server and Postgres it is a Database. A user - DB Owner must be created for the Database or Tablespace so the database create process has the rights to create and manage tables. Load balancing Task is simple. Each engine is installed separately and then they are connected to the same database. You do not have to put a load balancer in front of the Task web servers, just configure each Task engine to the same source. Having each Task engine connected to the same database will stop any duplicate record processing. This console page allows you to define and configure sources. Sources define the inputs to the task engine. You provide a name and policy rule for each source. The base Kinetic Task source has a type of Kinetic Task. All other sources have a type of Adhoc. An initial Playground source is included with the install. See the Getting Started Guide for specifics. Use the table at the bottom to add/remove policy rules to the source. To get started with Handlers click on the Build tab at the top of the page. Then click the Handlers tab on the left. This will bring you to the Handlers List page. The table shows every Handler present in the system. Using the Import Handler button will allow you to import any handler's zip file. Once loaded, the handler will display it's configuration page for you to fill out. The first two fields (Status and Selection Criterion) are present on every Handler. For now we can leave these as is. Under the properties header are fields that are specific to the type of Handler being configured. Note that some Handlers may not have any configurable properties. The last thing to do is to choose categories for the Handler. To categorize a Handler select the category from the Available list on the left and click Add. To remove a Handler from a category select the category from the Current list on the right and click Remove. Note that multiple categories can be added/removed at once. When a Handler is categorized it will appear within that category in the Tree Builder (in the right sidebar). If a Handler is not categorized it will not be available for use in the Tree Builder. It will still be available to workflows that have been already built with the handler within them (that are, perhaps, imported into this environment). Once you have configured each of the properties and selected categories for the Handler, save the configuration by clicking Save Handler button. Upon successful configuration you will be redirected back to the Handlers list.